We all remember going back to school after summer break. You would come into the room and the teacher would have you give a report called "How I Spent My Summer Vacation" so that he/she could get to know you. Unlike my youth I did not go to Cedar Point but I did bust out a lot of art. I started a series of work this summer focusing on some of my favorite bands that I have listened to and associate with periods of my life. 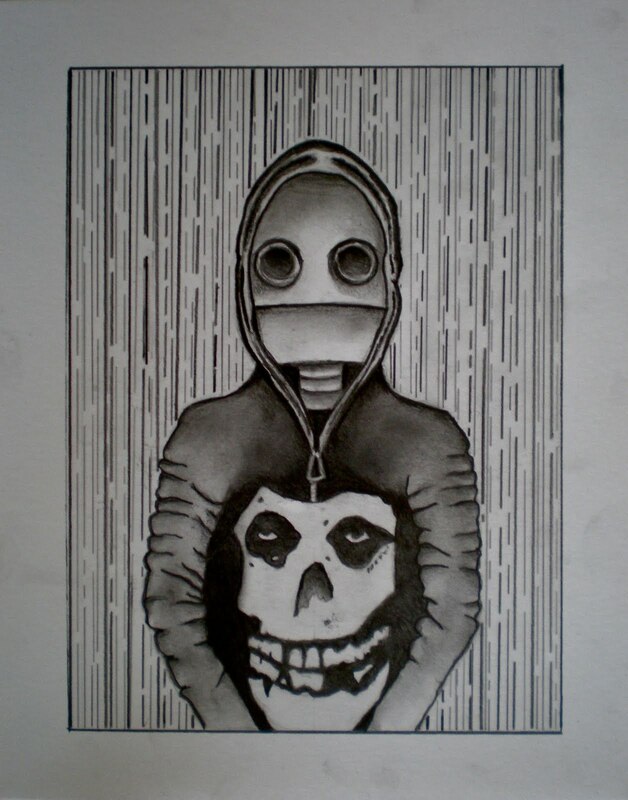 The first two pieces in this series are the Misfits Bot and the A Fire Inside (AFI Bot). The Misfits was the band that transitioned me into my love for punk rock and horror movies. I was making the jump from 8th grade to Freshmen year of high school and was listening to a lot of metal (Metallica, White Zombie, Pantera) and the punk bands that had recently appeared on MTV (Green Day, Offspring, Rancid). Naturally the combination of these two genres lead me to the Misfits and seeing the Crimson Ghost made me want to listen to what has become one of my all time favorite bands. While my love for AFI has faded over the years Black Sails in the Sunset and The Art of Drowning are still two albums that I can listen to all the way through. I listened to them a lot during the Summer and Fall of 1999 as my life transitioned from high school to college, which was a very large, life changing period for me, not only as an artist but as a human. The final image, Tha Devil, is a nod to my friend Christina aka Tha Devil. She was the captain of the Sprockettes, a space girl themed roller derby team that was a home team of the Ohio Roller Girls. She was a great captain but an even better friend. She is one of the strongest, smartest women I have ever met. She had wanted a piece of my artwork for years and after procrastinating on it because of various other projects, I finally sat down and created this for her. I am also working on 2 other projects to end out the summer. The first one is a 11"x14" for a Cult Movie Show I am in at the historic Southgate House in September. What will it be? All I can say is I think this is the first time I have ever drawn a rabbit. The other piece I have been working on for weeks is a monster 18"x24" drawing that is drenched in minute details. This is definitely the best drawing I have done since "We Live With Our Decisions" and also includes a tree. I looking forward to the Fall (my favorite time of the year). I am going to continue my two series, one focusing on trees/leaves and the other paying tribute to the bands that have been most influential to me. Stay tuned and be on the look out for announcements for future shows I will be taking part in.